Marvel, how can I read all these comic books? Plz. I dipped my toe back into comic books with Marvel introducing Miles Morales as Ultimate Spider-Man, and I fell in love. Then Marvel made Kamala Khan Ms. Marvel and like that I was reading comic books again, not just to support minority characters but to discover new ones that I hadn’t even paid attention to before. Like, DC’s Booster Gold, DC’s Harley Quinn & Poison Ivy, Baby superheroes (AvX & Tiny Titans) among others that now populate my comicbook library. 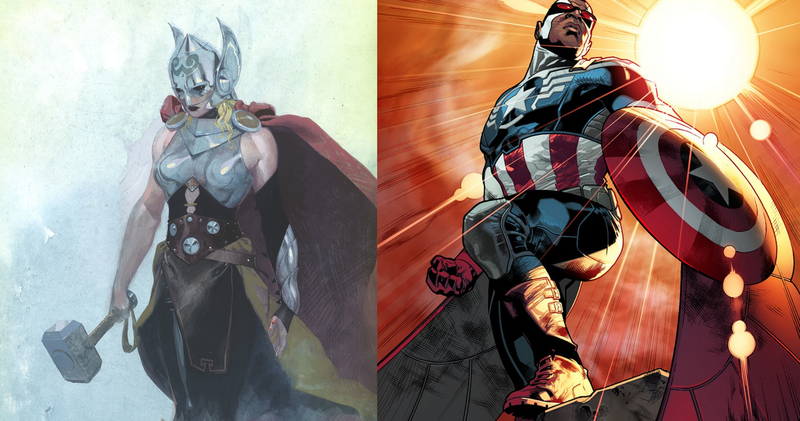 Now Marvel feel like they need to add more by handing over the mantle of Thor to a woman, and the mantle of Captain America to The Falcon, a black man. For the first time in forever, I’m overwhelmed with a wide variety of minority books to choose from in a genre that I’m passionate about. Argh. I can’t wait to sink my teeth into these books! Previous Post The importance of saving files.